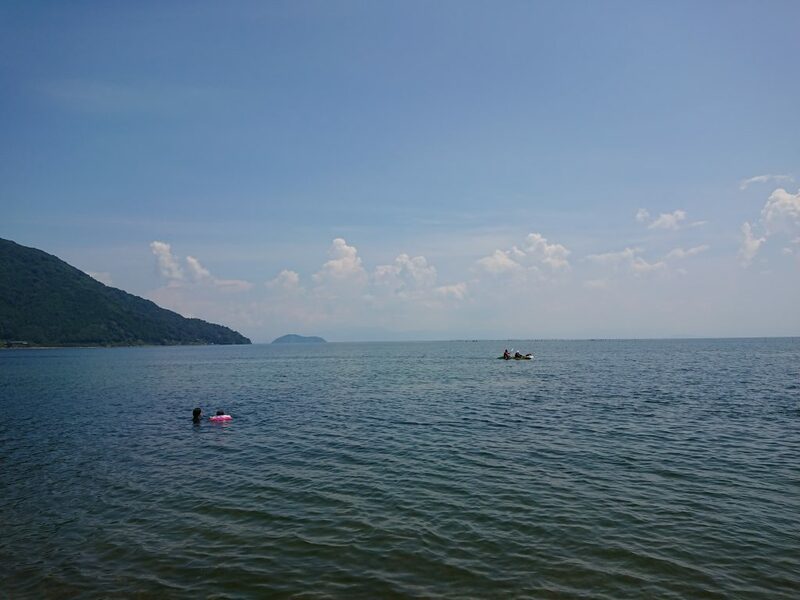 Obon national holiday in August was a perfect time to take a short break from coaching at Smith’s School of English Katsura and spend some time with my family at lake Biwa. This was our first time here during summer. Makino is in the north-western part of lake Biwa, easily reached by car or train. Our train ride from Kyoto station was less than one hour long. It’s a comfortable and interesting ride by the coastline with views of beaches and villages on one side and mountains on the other. Once we arrived at Makino station, it took us only five minutes on foot to get to the beach and our hotel next to it. It’s surprisingly easy to access this beautiful location in nature. We’ve spent three days in Makino, having fun on the beach, swimming, relaxing and doing beach barbecue. We could really enjoy our time. Surprisingly, such a great place wasn’t crowded and we had a lot of free space for ourselves. That was fantastic. There are many things you can do here. You can rent a boat with paddles and safety vests to enjoy the calm lake from a boat. Water is perfectly clear for swimming and for kids to play. Not cold at all. There are also hiking trails in the mountains surrounding the lake and a local farm where visitors can pick blueberries. We are definitely coming back to Makino. Very relaxing and comfortable place.